Another 2014 Gem from Revell ! The "Le Suroît" is a research ship of the French. Marine Research Institute "Ifremer". It was completed in early 1975. The ship was known because it was in 1985 one of the two research vessels that locate on 09/01/1985 the wreck of the "Titanic". In 1999, it was modernized and rebuilt. It is still in use today and her home port is Brest . The ship has a crew of 16-23 people. Le Suroit, a research vessel owned by IFREMER, was instrumental in helping discover Titanic. This ship carried an advanced side-scanning sonar array which helped section and eliminate vast swathes of sea floor from the search. Eventually, the efforts of Le Suroit and Argo paid off. Titanic was discovered 2.2 miles beneath the surface of the waves where she had lain for 73 years. Kit features two-piece hull, detailed superstructures, all around deck railings, cranes, SAR sonar, display stand, and decals for the 1985 Titanic Expedition. Brand new from 2014, Revell fill the gap with this new Harbour Tug Boat and a welcome one for maritime modellers. After crossing thousands of miles of open ocean, ships still have the most difficult part of their journey ahead. When they reach the harbor, tugs maneuver huge ships safely into dock. The Fairplay Shipping Company of Hamburg stations tugs in ports around Europe to accomplish this difficult task. Fairplay tugs are powered by twin engines and mount the steering and propulsion systems in a rotating assembly for extra maneuverability. Kit features two-piece hull, fenders, deck fittings, rubber dinghy, detailed bridge, radar mast, towing winch, display stand, and decals for three versions. Buenos días y Feliz Navidad para todos, en el Dia de Navidad aproveche el día para terminar el display del Missouri escala 1/200, termino midiendo 58 pulg. de largo por 17 pulg. de alto por 15 pulg. de ancho estoy pensando ponerle ruedas en un futuro para que sea mas fácil moverlo, comparto con ustedes 3 fotos, ahora si tengo donde guardarlo cuando lo termine. 1/150 MENG MODEL TAIPING CHINESE STEAMER "The Crossing"
The sinking of the steamer Taiping in 1949 shocked people in Mainland China. In the midst of the Chinese Civil War, people were fleeing from China to Taiwan. The Taiping was carrying perhaps over twice her rated capacity in passengers on her voyage when she collided with another vessel, causing the loss of 1,500 souls. The story is the subject of a new John Woo film, The Crossing. The first ship kit offering from Meng, the steamer Taiping is a type of Great Lakes passenger-freight ship made in the American Manitowoc shipyard. It was launched in 1920 with the load of 2050 tons. During the WWII, it was used as the short supply ship for U.S. forces and later sold to Taiping Dock Company as scrap iron. On July 14th 1948, it was rented by Shanghai Zhonglian Company with $7000 per month and changed into a passenger ship with the carrying capacity of 508 passengers travelling between Shanghai and Keelung. The kit (No. OS-001) is exclusively licensed by the film production company Galloping Horse and MENG releases it in 1/150 scale as part of a brand-new 'OS series'. This kit is 535mm in full length, 88mm in width and 208mm in height (from the bottom of the ship to the top of its mast). The magnificence of the ship can be easily realized by pre-colored parts; the model is designed to be cement-free for easy assembly; a lighting system is provided to simulate the scene of the brilliantly illuminated steamer Taiping; the package is uniquely designed as a “book”; stereograms are used to make the instruction manual special and exquisite. Whether you can build and paint models or not, and whether you own hobby tools or not, you can build the detailed model even only with a side cutter or even a pair of scissors; there is no need to upgrade it, because the lighting system included in the kit will create a brilliantly illuminated steamer Taiping. Such a different ship model, undoubtedly, will bring you an unprecedented experience. Hey Guys! 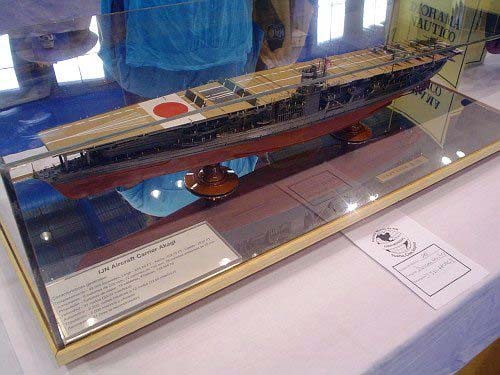 check it out, Wilmer Caballero's Akagi was published on www.modelwarships.com! CONGRATULATIONS to Wilmer! Also the Sovremenny Russian Destroyer is there as well go and find out! Wilmer is one of our proud members, from Ponce Puerto Rico, he specialize in building this excellents ships. See more of his work at our photo gallery. 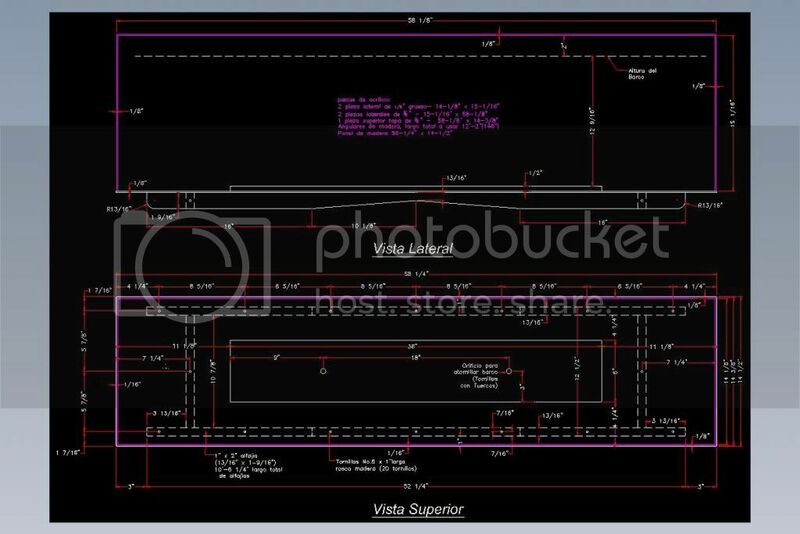 Buenas tardes a todos, Les presento el plano que realice en Autocad sobre el Display del 1/200 Missouri, fue interesante trabajar y crear este display. Bueno muchachos y aquí los aviones del Bismarck. Les presento un Scriber Marking Gage casero hecho fácilmente con materiales existentes en el hogar o fáciles de conseguir en una ferretería a precio accesible, esta herramienta se usa para delinear la linea de flotación en los modelos de barcos que no la tienen definida. Esta herramienta la construí en Diciembre cuando me llego el Missouri en 1/200. He aquí las fotos. Guys here the fotos of my model Trumpeter 1/200 USS Missouri. The model came to me this morning. Enjoy the photos.